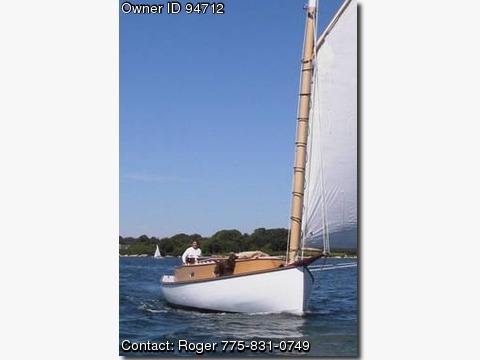 Call Boat Owner Roger 775-831-0749.Tigress’ 30’ Catboat built 1927 Wareham MA Designed and built by Charles Anderson Cedar Plank/Oak Frame Bronze Fastened Extensively Renovated 2000-2005 by Thomas Townsend and Owner Roger Fuller Sleeps 5/7 in bunks New Squeteague Sail 2013 38.5HP Beta Marine Diesel new 2002 With 19” AutoProp, 22 gal. fuel capacity 3.5 cu. ft. refrigerator, 6 gal hot water Paul Luke propane 2-burner stove/oven AC wired, 1000 Watt Heart Inverter/Charger Dual Solar Panels with Charge Controller New Interstate 4D deep-cycle house battery Garmin 3205 GPS, Simrad wheelpilot ICOM VHF with Remote Mic Jensen stereo with 6-CD changer Available Call Roger at 408-768-5875 Description: One-of-a-kind Charles Anderson 30&#8242; catboat, built 1927. Beta 37.5-hp diesel, Indel hot water, inverter/AC power, Paul Luke stove/oven, Indel refrigerator. Standard VHF, Garmin 3205 GPS, unique lighting, Fairclough cover, too many extras to list. Best Sailboat, Mystic Seaport ACBR 2003, Catboat Assn. Broad Axe Award 2004, second place MOY Tiedemann race 2009. I have entered Tigress in the Mystic Seaport Antique and Classic Boat Rendezvous every year since 2001, and she was Best Sailboat in 2003 and received Special Citations in 2006 and 2007. She won the Broad Axe Award from the Catboat Association in 2004, and was second in the Museum of Yachting Classic Yacht Regatta and Robert Tiedemann Memorial Regatta in 2008. The compass slips into the brackets in the space under the aft end of the cockpit table. The bronze hatch allows access to the space under the cockpit deck where the fuel supply and return valves, the Vetus Waterlok muffler, the fresh water pressure pump, the PSS shaft seal, and the shaft coupler are accessed. There is also storage space under there where I keep spare lines, fenders, and a bucket. The fuel filler deckplates are in the cockpit deck on either side of the table. The refrigerator is built in to the table with the door opening on the port side so it can be accessed from the cockpit or the cabin. The seat lids open to access storage underneath on both sides. I keep the anchors and rodes (a 20lb CQR plow type with 150' of half inch and 10' of chain and a 35lb Danforth with 250' of 5/8 and 20' of heavy chain) in the port forward compartment. Cleaning supplies are in the port middle, and the engine start/preheat/alarm panel (with hourmeter, fuel gauges, 2x12V outlets, bracket for VHF remote mic, and power plug for wheelpilot) is accessed under the port aft seat. The shorepower socket, shorepower cord, propane regulator for the stove, and cable for the solar cells are accessed under the stbd forward seat, where I also stow fenders and docklines. The stbd middle seat stows more fenders and a small cooler I use for ice. The aft stbd seat stows small lines for reefing. The steering gear is a giant worm gear system made by Edson. The bronze wheel is also Edson, replacing the wobbly original wood wheel in 2002. The black pulley mounted on the wheel is for the belt from the wheelpilot which mounts with a gudgeon and pintle setup on the cockpit deck near the gearshift. The boat came with a mishmash of blocks when I got her. The sheet blocks on the boom were bronze cage blocks while the halliard blocks were wood. Roger Winiarski of Bristol Bronze disassembled a few of the bronze blocks to have all the pieces to make patterns, then he cast all new replica blocks for the whole boat. Three of these pictures show the work on replacing the shaft log and horn timber that was done in winter 2004-2005. in "The Catboat Book" John Freeburg describes scraping out the rot in the shaft log and pouring in epoxy. By 2004, after I had used the boat extensively for 4 summers, the horn timber and shaft log were pretty shot, leaking a lot. We removed all the old wood and rebuilt everything from the engine beds aft, including a new bronze shoe bolted to the skeg for the lower rudder post and a new mount for the rudder post stuffing box. At least we got rid of the old iron drifts that held everything together - they were replaced with bronze bolts. This led to having to reposition the steering gear slightly. We also moved the engine forward a few inches and re-bushed the cutlass bearing, which required a second new propeller shaft. In the winter 2000-2001 the head was replaced, the head sole, bench, shelves and sliding door were built, and the original pullman sink was reinstalled. The new bronze blocks were made in 2001; the rewiring, breaker panels, new engine, engine beds, exhaust, fuel tanks, fuel valves and lines, propeller and shaft, hot water heater, refrigerator, speed/temp gauge, engine gauges, cockpit lighting, steering wheel, wheelpilot, and shorepower cord (50') were new in 2002 when we rebuilt the cockpit. The steering gear was also rebabbited at that time. The water tanks, holding tank, faucet, stove with propane system and interior lighting were new in 2003 when we took the interior down to the hull, red leaded everything, and built new cabin sole, cabinetry, bunks, midship bulkhead, countertops, custom copper sink, and hang-up closet. We also had a bronze mast partner cast and Tom installed it that year. The VHF and stereo were new then too. In 2004-2005 the shaft log and horn timber were replaced, a new skeg shoe was cast to form the lower bearing for the rudder, the rudder post packing gland was remounted, the steering gear was repositioned, the engine moved forward, and a second new propeller shaft was made. I used a portable Garmin GPSmap 76C until 2009 when I got a Garmin GPSmap 3205. The antenna is under the table above the compass and the unit sits on the table for use or is stowed below. I keep the GPSmap 76C aboard as a backup. In 2010 the fuel filter was replaced and I installed an electric fuel pump to make bleeding the system after a filter change much easier. The 4D house battery was replaced last year(2012), I think the group 24 battery is about 5 yrs. old. The bilge pumps are about 5 yrs old, I replaced the port float switch last summer. There is a washdown pump in the head under the counter. The boat has 12 lifejackets and two throwable cushions, four fire extinguishers, and a flare kit with current flares. The outside canvas is all "Toast" Sunbrella. The cockpit cushions are 2" mesh foam that doesn't absorb any water. The canvas items include a mast boot and covers for the foredeck scoop, skylight, hatch covers, table, steering wheel, and gauge panel. The interior cushions include seat and backrest for the quarterberth and both bunks, covered with Sunbrella, I don't remember the name of the color but you can see it in the pix. The bench in the head has a cushion upholstered with a leopard print. The cockpit cushions were made in 2002, the interior cushions were made in 2003. We used new foam for all the interior cushions except the big bunk cushions where the foam was good, so we just made the new covers. I have a set of terra-cotta flannel sheets and tan cotton blankets I will include with the boat. The cockpit and outside of the cabintop are painted with Kirby "Salmon". The interior is Kirby "Reddish". The spars are painted with equal parts "salmon" and white, we call it "half-salmon". I think the bunk decks, hull ceiling, and shelves in the head are also "half salmon". The interior overhead and bulkheads are painted with a mix of white with a touch of "salmon", maybe Tom can tell you what the ratio is. The topside is also just a little off-white with salmon. Tom used the flatter finish "workboat" paint.